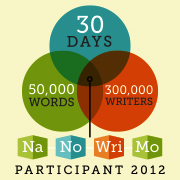 For those of you wondering what NaNoWriMo is: it's the mad idea of writing (or at least starting) a novel by writing at least 50,000 words in the month of November. Find out more about it here. Alright... first off, it's really a lot harder for me this year around. Unlike last year, my main problem is time. I have way more courses than last year and the work there will no longer be ignored. Because of that, I haven't written a word since Friday afternoon. I'm currently at 13,723 words - around 5,000 words behind. I hate it. I had hoped that even if I can't exceed the goal like I did last year, I'd at least be able to keep up. I haven't given up hope yet completely though. I hope that I'll find the time and the necessary pull to catch up, that I'll go into a writing frenzy and the words just tumble out. But last year's passion is slow in coming this time around, and that makes me sad. I'm having a hard time getting back in sync with the characters. I'm confused with my plot (or lack thereof). For once, I wish I was one of those people who write outlines. Having a written book in the back to go back to and link forward from seems to make things harder instead of easier, as I had thought it would. So yeah, my motivation is a bit low at the moment. I feel like I should do a million things at once and am half-assing them all. All those things are important to me, and I don't like half-assing things. I don't know what else to do though. If one of you has one of those time-inverter thingies (don't know what they're called in English, read it in German) like Hermione in The Prisoner of Azkaban, I could need one. How are you guys' projects coming along? Any tips or experiences to share? Similar problems, or other issues? Or are you lucky and everything is coming along amazing and you feel that buzz under your skin and constantly have a smile on our face and a spring in your step? Tell me about that too, maybe it will re-kindle last year's fire in me ;) Feel free to link me to your own NaNo post if you have one.